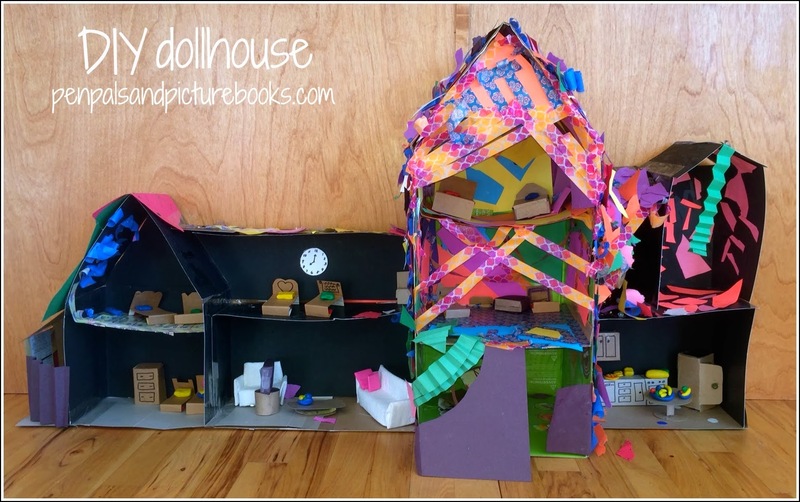 Pen Pals & Picture Books: DIY Dollhouse! Last week my kiddos had a bunch of grandparent related fun happening! You know, the usual: spoiling, getting away with stuff, ample supplies of treats, skipping teeth flossing, etc. 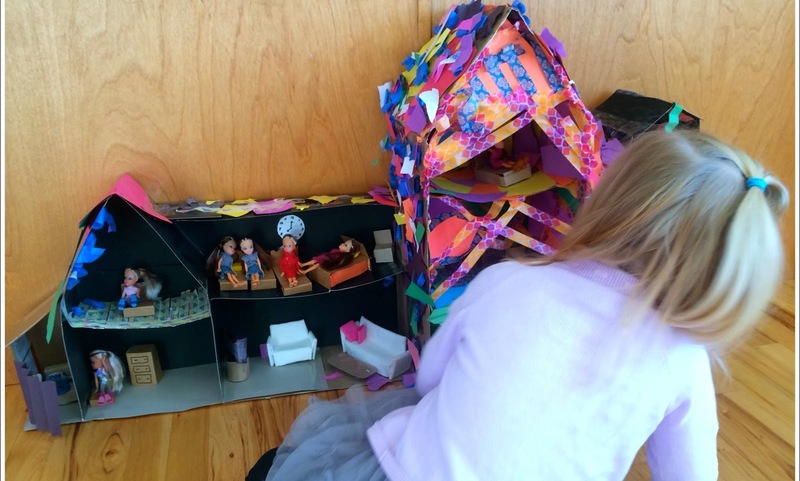 So, it's made completely from old cereal type boxes-- Oh, and tape. A LOT of clear packing tape!! And then it's been totally decked out by the kids! So awesome!! The furniture making was a lot of 'Grandma, make ______!' (Insert something that would likely be impossible to make from old boxes. But seriously she totally pulled it off!) Is that photo big enough? There's an upholstered couch!! A little toilet with toilet paper…made from toilet paper (this is like my kids favorite part. 'Look mom, it's real toilet paper!!") And there on the end, that's a little treadmill! Seriously so great!! I think the rooms are decorated how my kids actually wish their rooms were decorated…flowery carpets, streamers hanging from the walls. One of the rooms has a floor completely covered in sequins! Oh and there's little food too! Which is almost good enough to pretend to eat! (Pretend being the important word there!!) So fun! So so fun!! And besides being fun to make, its actually fun to play with too! Now I just need to go buy more glue and tape 'cuz we're pretty much completely out of both and Lilac has plans for some more room decorating in the near future. Yay! !